Akbar’s mausoleum was built by his son, the Emperor Jahangir, 8 years after Akbar’s death, completed in 1613. 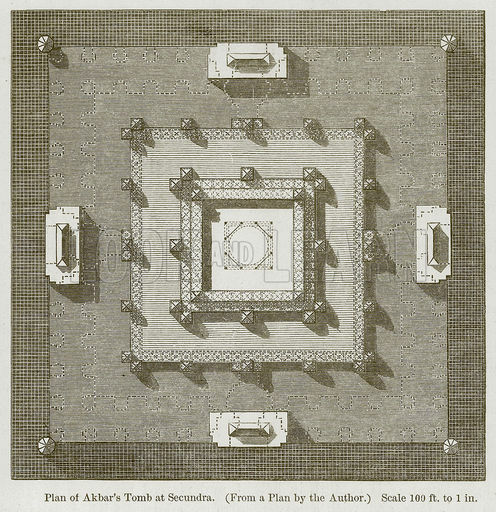 The scheme of the mausoleum is on a grand scale, its perimeter walls enclosing a large square garden, while the tomb structure situated in the centre of the enclosure is a square in plan of 320’ side and over 100’ high. In the middle of each side of the enclosure is a gatehouse, three of which are false doorways added for symmetry and the southern being the main entrance. 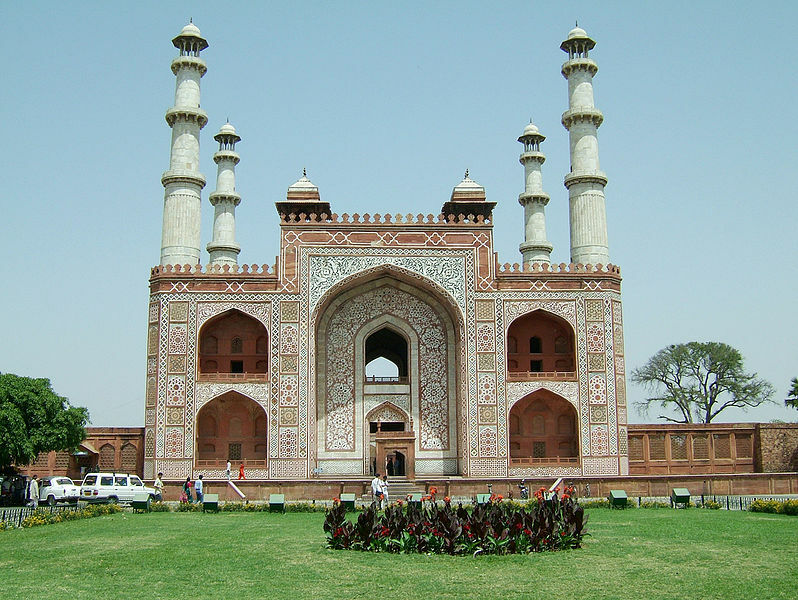 The main gateway is a minor monument in itself, with pleasing proportions and bold inlaid ornamentation along with 4 graceful white marble minarets, one above each corner. The arrangement of the garden beyond the gateway shows the collaboration between the garden designer and the builder to create a cohesive and unified composition. The wide flagstone causeways are expanded at suitable locations into square terraces containing a fountain and a sunk basin. The tomb building takes the form of a low truncated pyramid built up in three storeys. The ground storey consists of a massive terrace, over 300’ side and 30’ high, with a series of arches recessed within its sides. In the centre of each side is a tall rectangular structure containing an arched alcove with a graceful marble kiosk above its parapet. A doorway within the southern alcove leads to a corridor going to the tomb chamber which is a small cell confined within the womb of the building. Above the terrace is a series of sandstone pavilions, arcades and kiosks and is a light and fanciful structure in complete contrast with the powerful substructure. It may be assumed that this part of the mausoleum was built under the supervision of Jahangir who demolished what was built at this level and reconstructed it in accordance with his architectural ideals. The contrast between the ground and upper storeys reflect the contrasting characters of Akbar and Jahangir. The uppermost storey of Akbar’s tomb is in marked contrast with the rest of the structure as it is composed entirely of white marble instead of red sandstone. 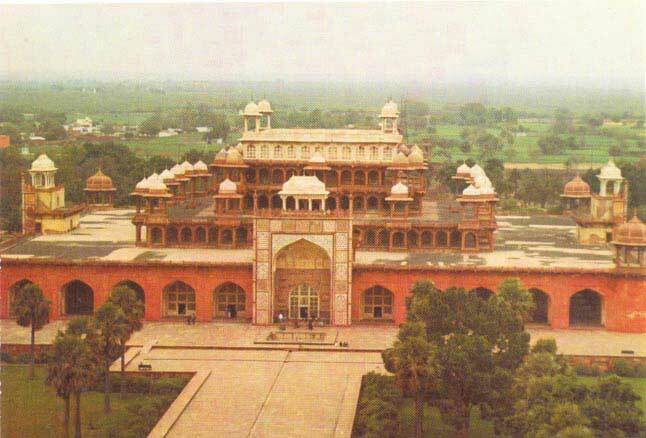 It is a massive structure with a solid projecting cornice with a tall and graceful kiosk over each corner. The entire structure is surrounded by a range of delicately perforated screens. The interior of this storey is an open court surrounded by arcaded cloisters and a cenotaph in the centre. It is probable that this storey was supposed to have dome to provide a suitable apex to the pyramidal elevation and to protect the exquisite craftsmanship of the cenotaph. Akbar’s mausoleum exhibits an experimental nature, its builders trying to depart from the conventional structures and achieve an original composition. However, due to the lack of proper vision and guidance, the experiment has produced a structure deficient in the essentials of coherence and mass and also unity and definition.